From just above Bettyhill, looking west to Ben Loyal and Ben Hope, on a glorious spring day on the North Coast. I’d been in Orkney, and was getting the lunchtime St Margarets Hope to Gills bay Ferry. The day was grey and dank, with low cloud and harr. As is my habit, I spent the journey on deck, as I find the trip over the Pentland Firth always fascinating. You never know what you will see. Just past Swona, as we hit some easterly swells, I looked west and saw that the harr stopped around Strathy Point, and the west was clear and glorious. So rather than drive home down the east east, I set off west, and on deserted North Coast roads stopped and took a pile of snaps. As it was early in the year the light was slow and in the west. 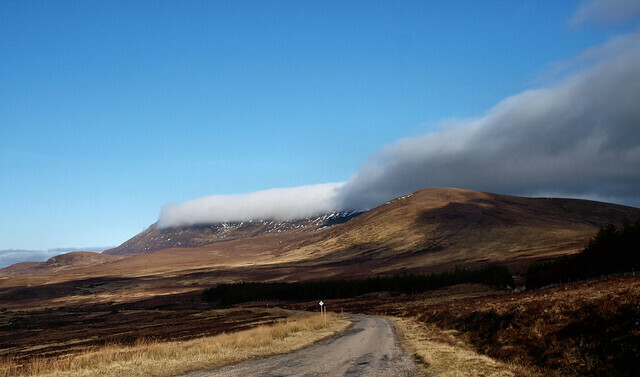 Coming back down the Lairg road, the harr set in again just after Crask, with Ben Klibreck, and it was dank and misty all the way home to Black Isle. A good decision, and a good diversion.